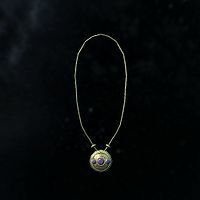 The Locket of Saint Jiub is given to you by Jiub for completing the Soul Cairn quest Impatience of a Saint. It is unusual in that it is one of only two amulets in the game to provide an armor bonus, the other being the Amulet of Articulation. Impatience of a Saint: Collect the ten missing pages of Saint Jiub's Opus. The armor rating does improve with a higher Light Armor skill, but the locket doesn't benefit from any of its perks. Getting hit while wearing it may increase the Light Armor skill. Despite being flagged as Light Armor, the locket cannot be tempered. This page was last modified on 29 November 2018, at 16:37.